When I finally got on the train at the airport and started into Osaka to the stop near my hostel, I was really excited to see the ocean again. What I didn’t know was that that would be the only time I would see the ocean again during my stay in Osaka. From the train, Osaka looked like a little fishing village that got picked up by a giant and stretched to eternity. The longer I was on the train the more impressed I was with the size of the city. And I hadn’t even seen a high rise yet. 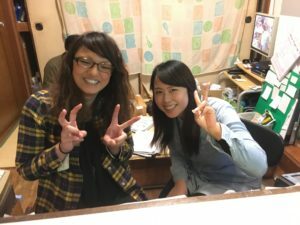 Yuki (left) and Aiki (right) work the front desk at Hotel Toyo and have been amazingly helpful. I had found a little place on Hostelworld called Hotel Toyo. Interestingly enough, just around the corner is Hotel Toyio. The latter is on the main street. My place was down an alleyway. That being said, I have thoroughly enjoyed my stay here. This is a hostel where young people come to stay, so there are teenagers and twenty somethings wandering in and out, but it’s very quiet. And the staff has been amazingly helpful to me. Even though I was very tired when I arrived (I slept maybe three hours on the plane and had been up for almost twenty), I decided to walk a bit and grab a bite to eat before heading to bed. Just near the Hotel Toyo is a covered street full of all sorts of shops. Cutting across the main street, this shopping district goes on and on. You rarely see any cars (unless there is a delivery of some sort). Mostly its people walking or biking about. I loved this location because it was truly local. Not many tourists would find themselves here. Usually, I was the only gaijin around. I was feeling scruffy, so, when I saw a barbershop, I popped in for a shave and a haircut. When I left Mitso’s shop, I decided that it was time to have some sushi. That was on my bucket list. Eat sushi prepared by a Japanese chef in Japan. About a kilometer later, I found my spot: Roku Sen. The restaurant wasn’t busy. I had come at an odd hour. And, so the chef (I didn’t get his name) there gave me his full attention. He even had a young man who was functioning as a sous chef who was busy pulling bones out of the fish. The meal did not disappoint. I’ve had miso soup many times, but this one had a more distinct flavor that surprised me. Plus there was an opened mussel’s shell sticking up out of the broth, like a lone island in a warm sea of vegetables and fish. I received a tray of sashimi and one of sushi. The fish was fresh and well prepared, and, between my warm sake and a healthy portion of wasabi, the coldness of the fish was well complimented. Now, I’ve never had this before. Whale bites. They were one two skewers and were resting in a sauce that had more of the consistency of a brown paste. They were quite good as well. Here is the amazing dessert I had at Roku Sen. But, and I know I’ll shock some of you here, the best part of the meal was dessert. I was stuffed, and I wasn’t expecting it. But the chef, whom I had already thanked profusely, placed it before me. So, I ate it. 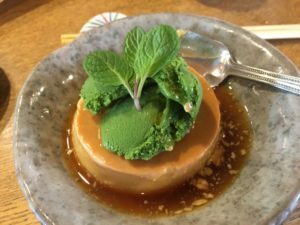 It was pumpkin custard with two scoops of green tea ice cream on top. Something amazing happened when I that custard and ice cream melded. It was simply divine. I decided to walk off my dinner before going back to the hostel. Per my usual routine, I just turned down random streets that felt right to me. And per usual, my nose led me to a cool place–where I met my first expatriate. If you can’t tell as of yet, I like good food. And, from time to time, I like to make good food. And I love a good kitchen knife. When I saw Tower Knives, I had to go in, and that’s where I met Joe from Silver City, New Mexico. 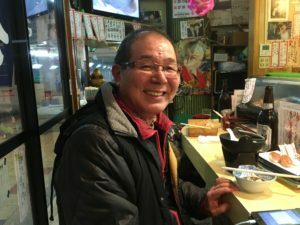 Joe came to Osaka as a foreign exchange student, and he loved it so much that he moved back here eight years ago. “I just realized that I was more comfortable in Osaka than in anywhere else I’d been,” he said. Joe’s an expatriate who works at Tower Knives in Osaka. 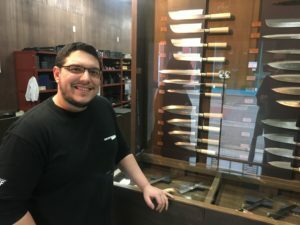 Now, Joe loves his job, and he loves the history of knife making in Japan. He told me that Sakai City, which is now a district in the sprawl that is Osaka, is the birthplace of kitchen cutlery in Japan. He explained that the knives were originally manufactured to cut tobacco that was being imported, but then someone realized that they did a pretty amazing job with fish too. Joe said that some ex-pats don’t really get it. He said that the people here are trying to maintain their culture, and they appreciate it when immigrants adapt. He told me that the people of Osaka are wonderful. “They like to eat and drink and tell jokes,” he said with a laugh. 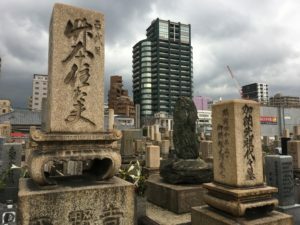 When I left Tower Knives, I was feeling pretty good about my first day in Osaka, so I headed out early the next morning to take in more of this amazing city. I took the subway to the Osaka Castle Park and got there just at sunrise. While I didn’t plan it, this was a stroke of genius on my part. There were no tourists at all. In fact, all of the buildings that catered to tourists wouldn’t open until 9 am. So, the park was full of locals. 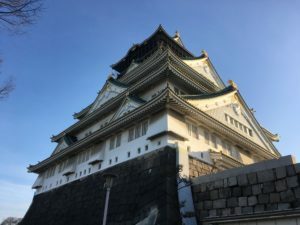 Osaka Castle is an ancient structure that is still quite impressive. It towers over the grounds and is surrounded by a moat. There were men practicing Kenjustu (swordsmanship), there were people walking with their dogs, there were joggers storming the ramparts, there photographers setting up their tripods and looking for a perfect morning shot of the castle, there was a man praying at a temple located in the park, there was a professional photographer and a model who were trying to get a shot for an advertisement of women’s running apparel, and there was a group of elderly people singing ancient Japanese songs to the morning. I made an effort not to photograph the people or to disturb them (there was a sign in the building where the Kenjustu was occurring specifically barring photographs), but I felt privileged to have been able to experience those moments. For the most part, it was as quiet as it was cold, with the exception of the mournful songs of the singers or the battle cries that would occasionally come from the dojo. If that morning was a time of peace and reflection, the rest of the day was a quest. I had to give up my canister of propane for my little stove when I got another plane, and I wanted to try to camp at least one night in Japan. So, I started looking for a store that could help me. This involved me getting lost on the subway system, getting lost in the streets, asking for directions multiple times and discovering that many Japanese people don’t speak much English. I covered over 7 miles at least by foot. In that time, I learned some pretty cool things: 1. The number one friend of a gaijin who relies on free wifi is 7/11, and you don’t have to look hard to find one in Osaka. 2. Cab drivers wear suits and look like professional chauffeurs. 3. There are tea and coffee shops that serve nothing but tea and coffee. Towards five pm, I found myself in the Namba district, which is where Osaka ceases to be a little fishing village and becomes a full-on metropolis dolled up with advertisements and binging on capitalism. I got a canister of gas from a place called mont-bell, and, even though I was hungry, I opted to leave Namba and head back to the hostel. I found a little shop in the market alleyway that I had explored the day before, had a bowl of ramen noodles, went back to my room, and collapsed. In my state of exhaustion, I had thought that I had booked a reservation for the next day (Thursday), but, after a nap, I checked again and saw that I had chosen to leave Friday. A wise move. I was still trying to get myself straight after the flight. So, I had one more day. After Namba, I decided to renew myself spiritually and physically. First, I went to Shitennoji Temple and spent almost two hours just looking around the place. I took some pictures, but I also took some time to just reflect. The people who manage the temple grounds are very friendly and eager to help visitors. One woman showed me how to properly light my candle, light the incense, blow it out (use your hand not your mouth), place the incense, ring the bell three times, and pray. I even climbed to the top of the main temple structure, a massive tower in the middle of the grounds. I thought about all of the cathedrals and churches that I had been to in Europe. There were a lot of similarities between those ancient structures and this one. They were places of quiet, places of amazing architectural and artistic feats, places of ritual and of financial donations (Light a candle in a cathedral in Europe, pay one euro. Light a candle in a temple in Japan, pay 50 yen. ), places associated with death (there’s a massive graveyard on the temple grounds), and places associated with transcending death. I was glad that I had stayed to see this beautiful place. After my visit to Shitennoji Temple, I headed for Spa World to indulge my decadent side. Now, I’m guessing that I will notice this trend everywhere in Japan, but, when the Japanese people decide to do something, they do it all the way. Spa World offers its guests seven floors to feel good. There are pools and game rooms for kids to amuse themselves while their parents go to the spa or enjoy a massage. There’s even a floor with restaurants, so you never have to leave during the day. You pay an entry fee, get a wrist band, and can enter the spa. And it’s not terribly expensive. I got in with 900 yen. If you want additional services, you’ll have to pay. I got a 60 minute full-body massage with hot stones and only paid 7,700 yen ($68 US). It was my first spa experience. I mean. I’ve used the whirlpool and sauna at the local YMCA, but this was a whole different kind of experience. There were rooms and rooms and rooms of different kinds of pools. You could lay on a slab of granite in 1 inch of water running down it, you could get into a granite bathtub, or you could enter a makeshift cave and rest beneath the rocky walls while your body was submerged in warm water. By the time I left the spa, I was feeling pretty well-relaxed. I was ready to make my post about my first Japanese city. But, as has been the case throughout most of my trip, the city itself was not through with me. I wanted to grab a bite to eat, and I returned to my favorite alleyway of shops. I saw tiny little sushi people filled with local. If he hadn’t been Japanese, the chef looked like he could have been working in a greasy spoon in the U.S. He wore the standard white cooks uniform, covered with stains after a long day. This place was tight too. Whenever they waitress, a lovely older woman, would walk by she would alway bump me and apologize. Takao is a fabulous artist who has been all over the world. But his heart is in Osaka. Though he tends to be a bit nostalgic, he loves his home very much. No one really spoke English–except for Takao Yamanaka. I had inadvertently sat down next to a prominent artist from Osaka, an artist who has traveled all over the world and sketched and painted. I know because he showed me his photos of his work on his phone. Like every person from Osaka with whom I’ve spoken, Takao loves this city. Takao worries that Osaka has lost some of its culture as it has become more modern, and a lot of his sketches, oil paintings, and water colors focus on what looks like an Osaka of old. He showed me a painting of the large television tower surrounded by a park. Then he told me that where we were sitting at that very moment is where the park was. It’s hard to tell what I’ll remember the most when I leave Osaka tomorrow: the old people being helped along by younger people, the men smoking cigarettes as they bike down the sidewalks, the feeling that the ocean is close but just not in sight, the common silence that everyone shares as they ride the subway, the loud gambling halls filled with pachinko and slot machines, or the medical masks that people of all ages wear to ward off infections. What I can say is that I will try to take a little bit of my first Japanese city with me as I head south to Mount Koya, but, considering how far Osaka seems to stretch, I wonder if I shall ever pass her borders. Mr Yamanaka is amazing, if you have a chance go visit his studio in the suburbs and experience the small town atmosphere there.